‘St Lucia will be no Pandora’s Box where students lift the lid and each takes what he or she requires’, declared J.J.C. Bradfield in his 1936 lecture to the senate and staff of the University of Queensland only months before the first soil had been turned at the new university site. Bradfield suggested that students may well come and learn at the university but through their education they would repay the world’s ‘general store of knowledge’. But the University needed an inspiring landscape to encourage education and reflection. Filled with curiosity about the possibilities of a new university site, St Lucia provided the opportunity to create a landscape for knowledge. 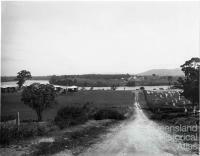 St Lucia was not always the designated location for the University of Queensland’s main campus. With the anticipated expansion of the University from its George Street campus, an area just behind the city at the centrally located Victoria Park site was set aside by the Brisbane City Council in 1926. But there were many disadvantages to the Victoria Park site, particularly ‘the rugged nature of the ground’. R.M. Wilson, who was present at the July meeting of the grounds committee debating where the university should be situated, firmed up this point by noting: ‘Victoria Park is not suitable for an agricultural school which in a State like Queensland should be one of the most important’. 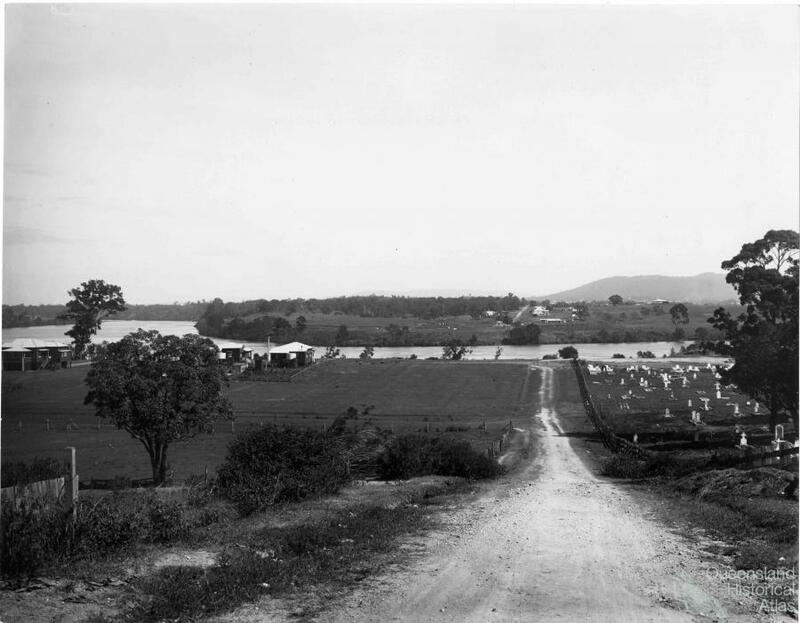 The location of the University needed to have the landscape features to provide the educational needs of the State – agriculture and mining especially were considered important for a full Queensland education. 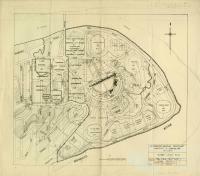 Following the debates in July 1926 the Victoria Park site was all but abandoned and the St Lucia site was favoured. 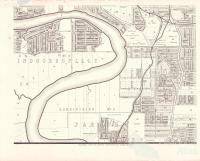 But how to pay for such a large parcel of land right on the river? 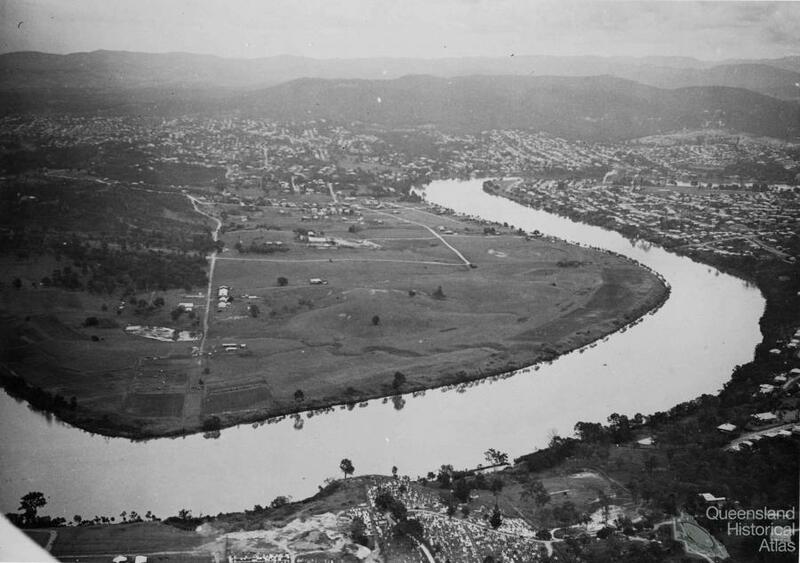 In October 1926, the Brisbane Mayor W.A. Jolly announced that the city should acquire St Lucia for the new university site but because of the cost involved could not afford the site. James O’Neil Mayne of ‘Moorlands’ Toowong was enthusiastic about the location and went to the mayor offering financial support. Mayne and his sister Emelia donated over £60,000 to resume the land at St Lucia for the University. The 976 land parcels were resumed by the Brisbane City Council and the cottages of the 284 people that were living at St Lucia were sold off to raise further money. 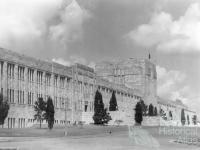 The site was handed to the University on 19 June 1930. St Lucia has undulating land with fertile sandy loam soil and some heavy alluvial patches that made it suitable for both dairying and cropping. With the St Lucia site firmly secured the University began the lengthy process of raising funds for the building project. In this waiting period, with the availability of fertile land close to Brisbane city and high levels of unemployment in the Great Depression, a short but distinct phase of land-use occurred. In 1932 it was proposed that Queensland must actively engage in a ‘young man’s land movement’. Unemployed young men from the city who had no rural experience would be trained for ‘life on the land.’ The University and the Department of Agriculture made the necessary arrangements and by January 1933 the St Lucia Farm School accepted its first intake of young men between fourteen and twenty-one. The farm school was a country image located on the urban fringe, and it was also an image that suggested harnessing natural wealth would overcome severe economic problems. In 1934 when J.F.F. Reid surveyed the farm for the Queensland agricultural journal, there were English potatoes, sweet potatoes, pumpkins, cabbage and arrowroot growing. Irrigation systems were used to harvest water from the creeks and lake. Queensland nuts were planted and it was thought that ‘within a few years these beautiful and striking native trees should form a striking feature of the St. Lucia landscape’. when the University buildings at St Lucia were being planned there was a hope that the campus would give some feeling of the great distances and spaciousness of Queensland and there are those who think this has been grandly achieved with the Great Court: others feel that its proportions are wrong and it is rather like a “fence round a paddock”... if indeed it is like a “fence round a paddock” nothing could be more appropriate because the state of Queensland was largely created by putting fences round paddocks. The farm school offers a different way of seeing the land at St Lucia. More intense agriculture was envisaged as an important way to pull through the Depression of the 1930s. Farming and timber cutting were also important ways that young men could engage in rural pursuits. As the farm school was training youth in ways of the land, St Lucia was also being carved out in the minds of academics. 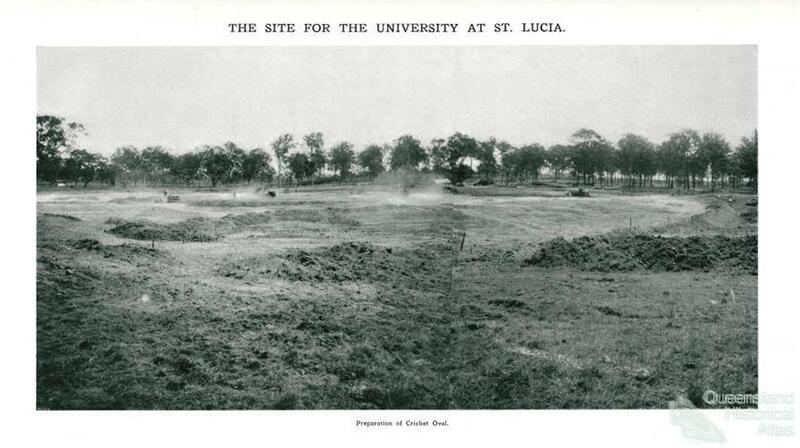 The site at St Lucia also became a place to be imagined in the minds of academics and planners on the University Buildings and Grounds Committee. In typical university style much of this discussion was presented in lectures to staff and students. 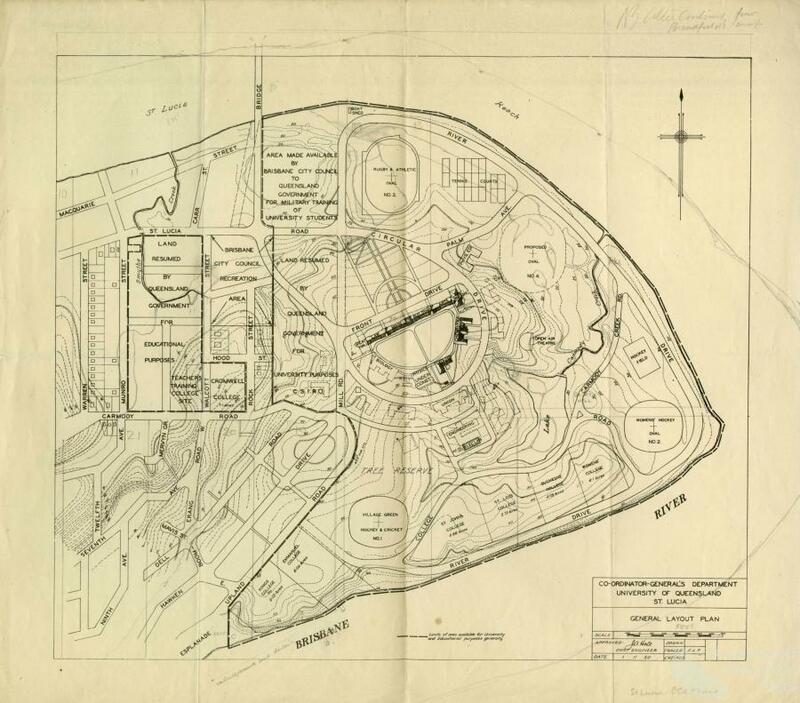 In 1933, Frederick Walter Robinson, professor of English and a member of the grounds committee, delivered a lecture to the staff about the new site at St Lucia. No ground had yet been turned at St Lucia and to Robinson two things of ‘enduring value and beauty’ were possible. First, it could become ‘a living museum’ of the trees and plants of Queensland, indeed of Australia. Second, with wise planting of trees, shrubs and vines, ‘St Lucia can provide Brisbane with a thing of beauty for every month of the year’. This ‘museum of trees’ was a significant point that was discussed at length after Robinson’s lecture. Robinson was obsessed with trees. With the notes of the 1933 lecture he compiled a three page list of trees and their appropriate dates for planting. He was not just interested in planting trees, but also the trees that were already at St Lucia. He demanded that before building on the site an ‘effective tree policy’ be enacted. He told the staff: ‘not a single Australian tree at present standing on St Lucia should be cut down!’ In Robinson’s lecture trees appear as a dominant feature of the landscape as he observed it in 1933. But, as photos of the site show, the trees were in fact an inspired part of Robinson’s imagination. 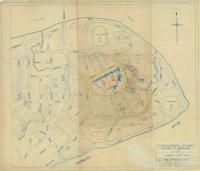 As a companion to his lecture, he compiled a hand drawn map of what St Lucia might look like. The buildings would be positioned at the highest points and trees would dominate. In among these trees there would be a ‘Philosopher’s Way’ which was a pathway that would trail through the campus – an inspirational and transformative experience for the black gowned scholars. In any country the creative power of nature herself is the model to be imitated, and what more beautiful than Queensland’s trees. Architecture must create the beauty it produces and surely our trees have a local and characteristic beauty which can be symbolised in the architecture of the University. The grand trees would provide the impetus for the buildings to be modeled on. 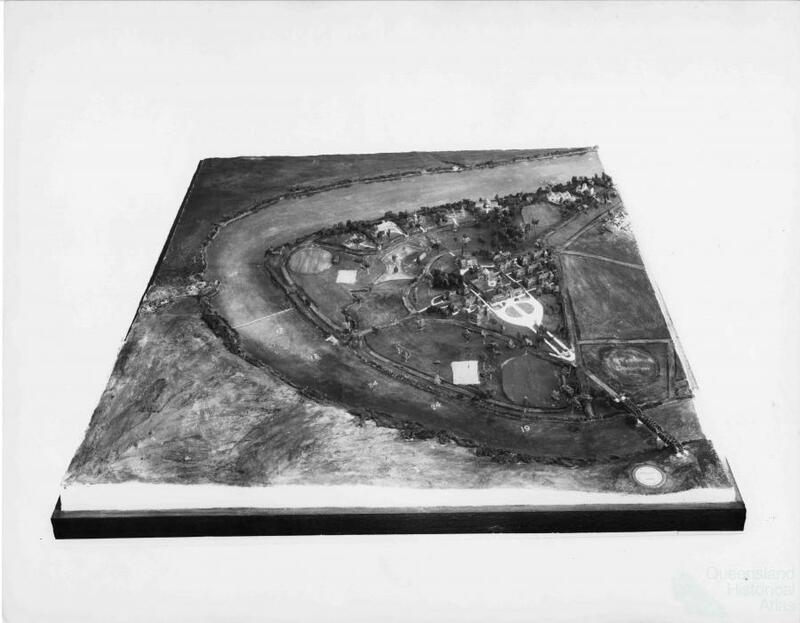 A landscape created in response to the power of nature, yet looking at the pictures of the small model that accompanied Bradfield’s lecture, the new university looks similar to an English country estate. For Bradfield the University would contribute to the mighty ‘wealth’ of Queensland. In the mid-1930s when Bradfield was preparing for his lecture he walked the land at St Lucia and took photographs. 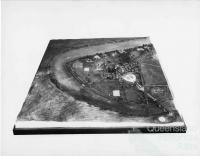 The photos show a farm on the edge of the river. The land appears to have been heavily worked for agriculture: from an earlier sugar mill to the St Lucia farm school. The riparian zones of both the Brisbane River and Carmody Creek have been heavily cleared. What is most compelling in these photos is that nearly all the 240 acres of the site, apart from a small remnant forest in the south-west corner, was destitute of trees. There were cow paddocks and fences but rarely a tree. In the lectures by both Robinson and Bradfield ‘nature’ and the beauty of the St Lucia site would ensure that the University of Queensland would be able to contribute to the world’s ‘general store of knowledge’. Furthermore, both Robinson and Bradfield were quite clear that the land, despite its agricultural past, could be carved back into something that was beautiful and picturesque and a productive setting for knowledge to flourish. 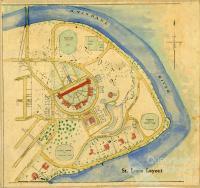 For many the construction of the landscape at St Lucia was intended to inspire a curiosity and a thirst for knowledge. From the earliest proposals for the site at St Lucia it was designed to be linked to Brisbane city by the quickest route, which was a bridge from St Lucia to West End and link in with the Victoria Bridge. Even though it was maintained in the plans up until 1953 the bridge was never built. However, the proposed bridge determined the direction that the first buildings faced. In 1936, before building commenced, the Commonwealth meteorologist took the wind directions at St Lucia. In the winter months the wind came from the south and south-west. But for most of the year, the warmer nine months, the wind came from the north-east, the east and the south-east. In Brisbane, the classic orientation for homes and buildings was to face the cool north-east breeze. But if the buildings at St Lucia were to face north-east they would look away from the city and towards Dutton Park. The buildings were built to face the city. 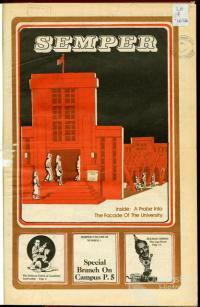 The foundation stone of what is now the Forgan Smith building was laid on 6 March 1937. Construction commenced soon after but was suspended during the war. After serving as the Australian Army headquarters and then used by the Council for Scientific Industrial Research, by the 1940s the huge sandstone buildings were standing tall at St Lucia. Only Queensland materials (with the notable exception of the steelwork because Queensland had no steelworks) were used in the construction of the buildings. In April 1949, a ‘small area’ of forest near Upland Drive was recommended to be preserved in perpetuity as ‘a measure of utility, beauty and distinction in an Australian University’. Buildings quickly littered the St Lucia landscape. By June 1950 the University Suggestions Committee recommended that precautions needed to be taken in developing the St Lucia site too rapidly. 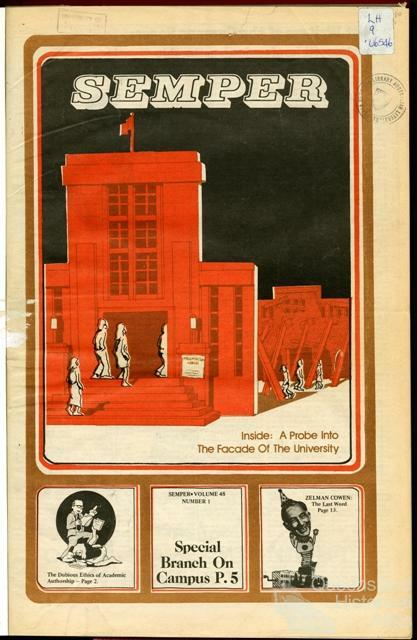 ‘That every care be taken to prevent destruction of the distinctive landscape of St Lucia by an overburdening of the site with buildings or by any other means.’ The 1930s vision of a productive university on an aesthetically pleasing landscape succumbed to the pressure of growing enrolments and diversification in what was then Queensland’s only university. The whole design is socially repressive. It is reminiscent of the huge Pentagon block in Washington, the huge Palace of the Soviets in Moscow, or a Mussolini stadium. It is inhuman, out of scale with human figure. It belies the climate, it belies the structure, it belies its purpose. It is designed to impress people, in a pompous manner, with the importance of the University, the Architecture and the Government. It is popularly known among the students as “the Mausoleum”. 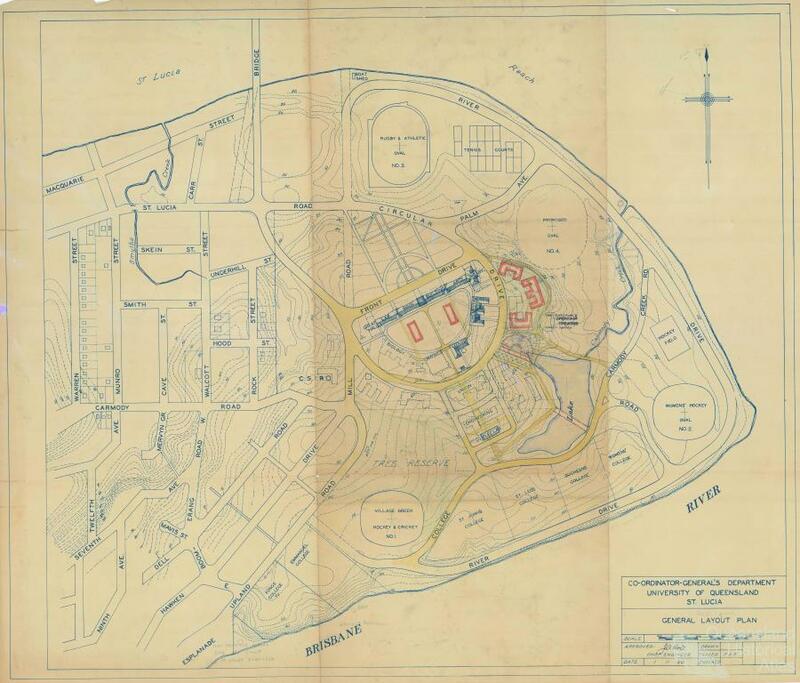 No matter how ‘pompous’ and arrogant the buildings appeared to be for students, the grounds committee pushed on in its vision for a ‘Queensland University’ by planting trees that would accommodate the new sandstone buildings. In 1955 Frederick Robinson sat down and compiled an extensive history of the University site at St Lucia. Although professor of English, working with the grounds committee had given him a profound knowledge of the history of the land at St Lucia. A lot had changed since he imagined not a single tree would be removed. By 1956 he began to notice that it was not the trees but the sandstone that ‘gives the prevailing character to the whole university fabric’. This comment still seems to ring through the St Lucia landscape, from student perceptions to marketing images on the University’s website. The University at St Lucia is not just a ready-made place to come and learn at but also an intentionally designed landscape envisaged to foster knowledge. The institutional feeling of universities often leaves one flying high above the landscape on the way to gaining a degree or pursuing research. But when walking the paths at St Lucia it might be illuminating to think of the trees that inspired visions of a ‘philosopher’s way’ and of the commodities that came from all over Queensland to construct the buildings that now dominate the landscape.